I’m sure being inside the head of American actor, writer, director, producer and fashion designer John Malkovich would be a fascinating, if not a disturbing space to be. I would settle to be in a space beside him for as long as it took him to sign and dedicate my sketch. That space happened to be The Barbican in central London on a Saturday in mid-June 2011. Like his imagined persona, JM can offer a variety of responses to graph – both auto and photo – requests. One thing I did find out from the zombies, who were circling the foyer in numbers, Mr Malkovich walks in the front door – no sneaking in side entrances for him. His signature used to be recognisable in the early ’90’s – all letters formed in the conventional manner as per the English alphabet, spelling out his name. Now it looks more like the print out from a cardiograph machine. John Gavin Malkovich has appeared in over 70 motion pictures, spanning a 30 year career. He’s also directed and produced a few and written a screenplay. To complete his Renaissance-man image he set up his own fashion company, ‘Mrs Mudd’ in 2002. Among other things it includes the John Malkovich Menswear Collection called ‘Uncle Kimono’ and he designs the clothing himself. He was hopefully entering the front door of The Barbican that Saturday afternoon in mid-June to take part in a Q&A following a screening of DANGEROUS LIAISONS . He was also performing a two-day season of the unusual one-man play, THE INFERNAL COMEDY, playing the role of the notorious Austrian serial killer-Jack Unterweger. It was a solo acting part… along with a baroque orchestra and two sopranos, singing arias about murder and abandonment. Not one of your cheeriest days in theatre. So, would he be in character-method acting? Pretty hard to get a graph from a serial killer…without some fatal injury. As it turned out, Mr M was already in the building, possibly using a side door and was wandering around the foyer, talking on his cell phone… followed by a line of autograph hunters. It resembled the Pied Piper. I decided to remain in one spot and watch the carnival, which eventually came past me.. and stopped… because the prey stopped. He saw my sketch, completed his call and asked me if I wanted it signed by him – a novel reversal to the norm. He did so with his cardiogram sig and dedicated it, as well as signing a BEING JOHN MALKOVICH film poster. Then his phone rang and he popped back on it and the procession started all over again around the Barbican foyer on that bright Saturday afternoon in mid-June. 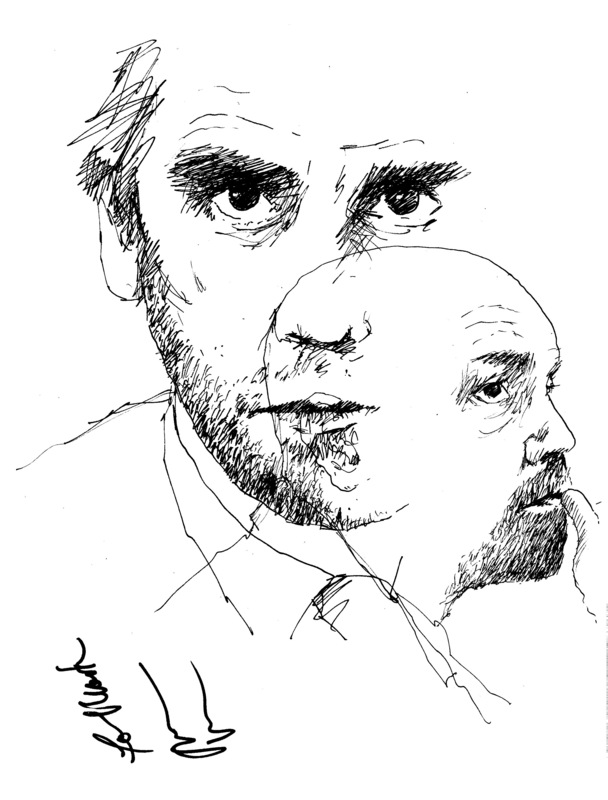 This entry was posted in Celebrity, Film and Television, Theatre and tagged Autograph, Being John Malkovich, Drawing, John Malkovich, London, Signature, sketch, the Barbican, THE INFERNAL COMEDY, Theatre by Mark Winter / Chicane. Bookmark the permalink. What an incredible stroke of luck! Fantastic drawings. I always loved life drawing, but struggled with faces somewhat. You’ve captured his likeness wonderfully.